The link below is to an article that looks at a number of statistics involving reading for the USA. 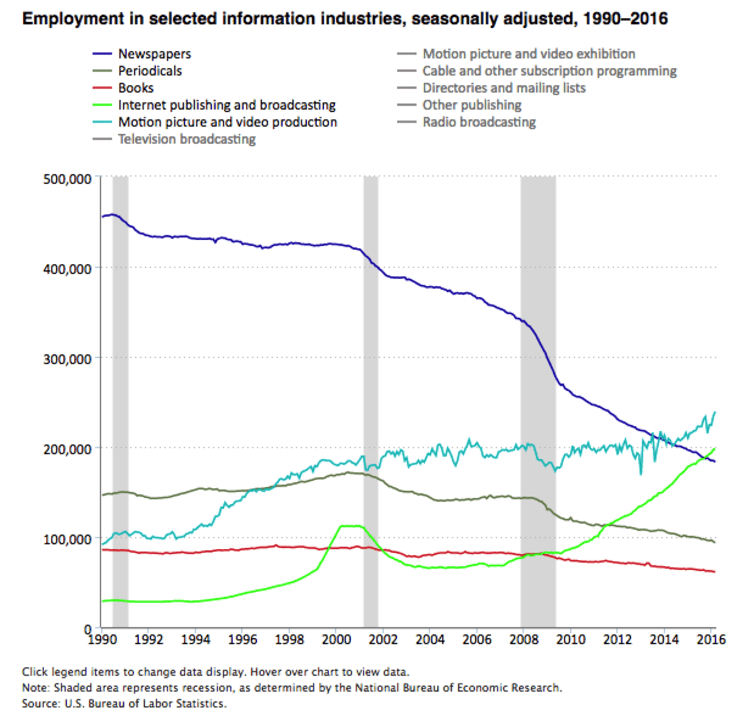 The impact of the Internet on the newspaper industry has been starkly highlighted by a graph released by the US Bureau of Labor Statistics. 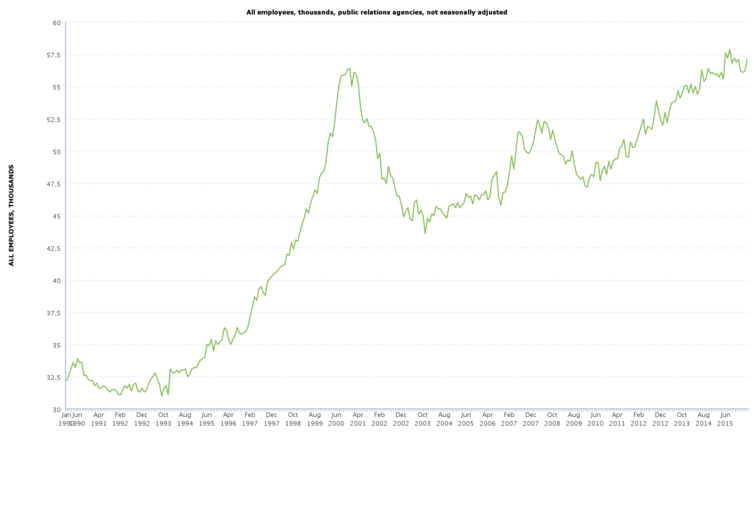 It shows how employment in that industry in the US has declined by 60% over the past 25 years, from 458,000 in 1990 to 183,000 in March 2016. Another growth area in that time has been in the massive increase in the number of people working in public relations which peaked first in 2000 at the height of the Internet “Bubble” to regain those heights in the subsequent years. The numbers are more stark than they appear because in that same time, overall employment has increased by 23% with the US labour market adding 35 million new jobs. This data simply confirms what has been obvious to everyone that with a disappearing business model for print newspapers, there is little room for the industry as a whole to continue to the same degree. The consequences of this are again not really going to be that surprising because in the end, it will be dictated by newspapers, who become predominantly digital, can make money. For a very few, this may be through digital subscribers. The New York Times, one of the few news sites that may pull off this transition with over a 1.2 million digital subscribers, still loses money. For most other sites however, digital revenue will come from advertising, driven by the types of content that drives clicks. The Internet has not just impacted the print newsroom however. The Bureau of Labor Statistics data also shows significant declines in both the magazine and book industries. Again, this decline has been driven by falling audiences and revenue in the switch from the more lucrative print market to digital. The disruption of the paper-based media industries by the Internet hasn’t just been a question of doing the same thing with fewer people on a different medium. What has also changed is society’s need and desire for this specific type of content. The disruption of these industries isn’t a question of simply not moving quickly enough to adapt to a new presentation format, it is that the content produced has far less appeal to the current audience who are increasingly spending less time on news sites and more time accessing content through social media and in particular, as video. 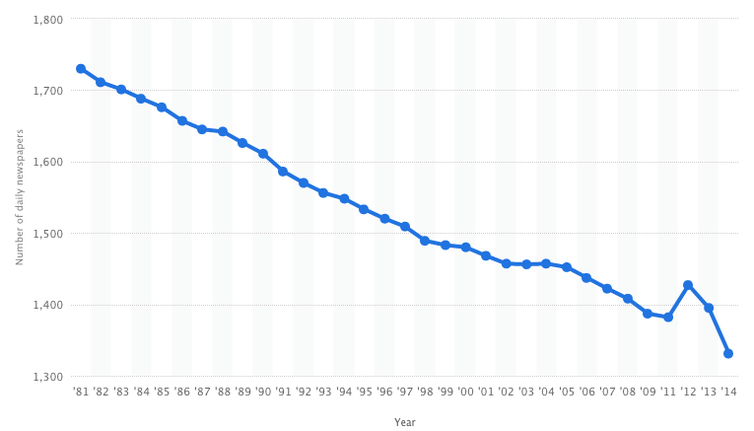 The link below is to an article that takes a look at the decline and fall of book reviewing.